I worked for WNYC AM as an engineer from August 1937 to January 1940. Those were the Depression years and getting a civil service job as an engineer at a radio station, which was my goal at that time, was an accomplishment. My first duties included rewiring the studios and master control using lead-covered wire. The assistant chief engineer, Bill Pitkin, who designed the system, was a retired Navy man. Thus the lead. WNYC then operated on 810 KC -- it was cycles then, not Hertz. Edwin Armstrong was still experimenting with FM transmission. WNYC operated from approximately sun up to evening because being on the same frequency as another distant station caused interference to that one. WNYC was owned and operated by New York City with studios in the Municipal Building in downtown Manhattan and the transmitter in Queens at the edge of the East River. Being licensed and operating from the early 1930s, it could be considered about the first public broadcasting station with programs consisting of classical and semiclassical music, talks, news and public events in the city. Music programs were both live and recorded. Incidentally, records were spun by the announcers not the engineers (BT, i.e., before tape).  This photo, ca. 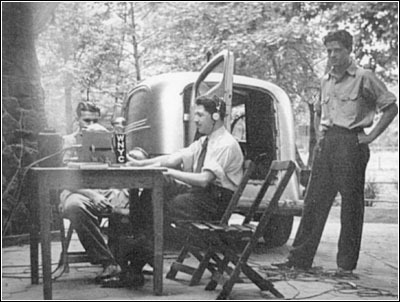 1938, shows the author Edward Golub with earphones, center, on location with WNYC. The vehicle in the background is a late 1930s panel truck, which transported the remote broadcast equipment. The studios included a large one for concert orchestras. This brings to mind an incident I experienced. During the 1948 presidential campaign, Tom Dewey, Mr. District Attorney at that time, arrogantly insisted on speaking in the largest studio instead of a small one which had better acoustics. I remembered that and voted for Harry Truman for president. Live programs were not limited to the studios. "Remotes" were frequent, such as broadcasting the Goldman Band at Central Park, symphony orchestra concerts at Lewisohn Stadium at City College, programs at the Brooklyn Museum, tennis matches in Queens, and many other events on location. Remotes were not limited to the city. We went far afield for classical music to Saratoga, New York, and Music Mountain in Connecticut for a famous quartet. For the first few programs from Music Mountain we had to use a small radio transmitter on 1620 Kc with the antenna wire flown up by a balloon. A receiver at a nearby town picked up the transmitter's signal and fed it to a telephone line to the studios. A direct line was finally installed, and the rest of the summer concerts went on without a prayer. Two of the more famous programs from WNYC were Mayor Fiorello LaGuardia reading the Sunday comics and the weekly broadcasts of the City Council meetings at City Hall. Those Tuesday afternoon Council Meetings were so popular that people would gather at parked taxi cabs and radio stores to listen to the animated and heated discussions in accents from Boston Brahmin to Irish, Brooklyn and Russian. There were times when those meetings ran into the night and we had to borrow blank acetate recording discs to record the proceedings because the official stenographer had collapsed. A survey showed that these broadcasts had the largest listening audience because people were really interested in the activities of their legislature. Among the personalities I worked with was Tommy Cowan, considered to be the first announcer in broadcasting. He had a phenomenal memory of opera and its many famous artists. He also told anecdotes about Thomas Edison. Announcer Tony Marvin went on to become the announcer for Arthur Godfrey. Another (the name escapes me) started a Sunday call-in program called "So You Know Music" and went on to a high position at NBC. Since broadcasting was live, unexpected events occasionally required announcers to ad lib for long periods. Among us engineers, we all moved on to NBC, CBS and Mutual networks. A friend and classmate, King Stodala left to work for the military in New Jersey and was noted for hitting the moon with radar. I decided to leave broadcasting and become a teacher of science and electricity with the New York City Board of Education. My experience in broadcasting and music eventually led to a position as Technical Director of Audio Visual Instruction for the Board of education, City of New York.  Figure 1. My 1935 Stromberg-Carlson Model 68, 10-tube, 3-band console. First, a great radio should be HEAVY. Atwater Kent and Majestic never made an AC set that weighed less than 50 pounds to my knowledge. The cabinet should be absurdly overbuilt, with a top of solid lumber core panel about an inch thick. Better yet, the cabinet should be solid walnut like a Scott. The front should be made of quarter sawn, crotch burl walnut inlaid with ebony, zebrawood, and maple. My Stromberg-Carlson 70 console has a separate speaker enclosure with woofer and tweeter that weighs about 100 pounds. 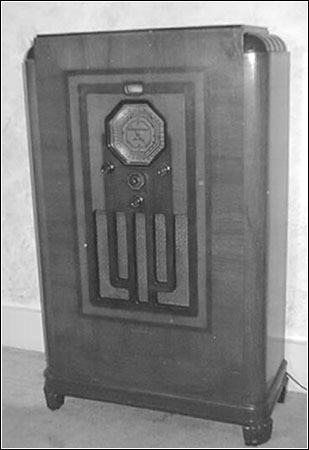 My Stromberg-Carlson Model 68, shown in Figure 1, is not really big, but it does qualify as a heavy radio. Second, the radio should be designed and laid out to be as wasteful of space and energy as possible. The chassis must be 1/8"-thick plated steel. It should be roomy enough for a nap, and arranged first so everything looks neat and organized, with function second. Lots of big dog bone resistors are cool. Multifunction tubes and efficiently run rubber or plastic wiring are just horrible -- sets with separate oscillator tubes and neatly bundled cloth-covered wiring are where it's at! The best looking tubes, of course, are balloon shapes, though they don't make for a very functional set. So billions and billions of shouldered ST tubes with big fat pins are the way to go here, plus a nice eye tube or meter. Banks of 45s in push-pull parallel are best; obviously, all beam power tubes are hideously gauche. How can a console with a single ended 6L6 output have any dignity? The radio's top should keep food warm during operation. A fuse holder with 110-volt and 120-volt positions is always in good taste. The word "television" must NOT appear on the back of the chassis, and no pushbuttons on the front either. Three stages of variable IF bandwidth with bizarre mechanical coupling are a real treat. Third, there can't be any door over the controls. (I don't mind them, but most people seem to hate them.) The dial should be round and about 12" to 18" in diameter, with cryptic arcane things like "BULGARIA" AND "RADIOTELEPHONE" written on it. There should be lots of bands, say seven, and as many knobs as possible. If the knobs are one-of-a-kind, carved ,virgin Honduran mahogany that go for $40 each on e-Bay, so much the better. Fourth, the grille bars should be about a 1/4" wide, and cut into as elaborate a pattern as possible -- flowers, woodland scenes, and mythic creatures, for example. The grille cloth should not be available from anyone in repro, and should also have an elaborate pattern and lots of texture. The speaker must be at least 12"; 15" is better, and a tweeter, if present, is fabulous. The speaker should be bolted to a crossbar in the cabinet as it's weight would distort the 3/4" thick front panel of the cabinet if fastened conventionally. Fifth, the power transformer should be about 6" square, and there should be a giant choke, as well as the humongous field coil making a two section pi filter network. There must be a hum bucking coil in the speaker and a hum control on the chassis. Speakers with 6,000 ohm field coils that use four pounds of #40 magnet wire shunted right across the B+ get extra Brownie points. Cloth power cord should be 3/8" or more in diameter, with a nice drapey soft texture so unlike that nasty, stiff, skinny, repro stuff. Sixth, for my own tastes, the radio must not be made by Zenith, as I just won't pay through the nose for the Commander's stale hype. Zeniths are the best radios in the world as Cadillacs are the best cars. If you believe that, you probably think Nixon was innocent too. Finally, the radio should come from a friend of a friend, church rummage sale/auction, or someone who read your ad for old radios wanted. A real radio meet is good too, but there you'll have to listen to a lot of whining from the seller about how he has no room for big radios. Don't talk too long to him, as you'll find out the radios are all confined to a small back room, with consoles back to back in the middle of the room. Someone, please shoot me if I ever put a console in the middle of a room! John Hagman is a Vermont "radio archeologist" with a talent (or weakness) for barn and basement dwelling radio orphans. His specialty is high-end wooden sets, 1930-1940. Copyright © 1996-2003 by John V. Terrey - For personal use only. Last revised: October 4, 2003.